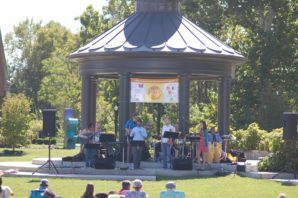 This February, Jazz Arts Group completed the third year of the We’ve Got Rhythm program, through the Ohio Arts Council’s Creative Aging Initiative. This initiative has challenged us to create programming that encourages older adults to tap into their creative juices through music. 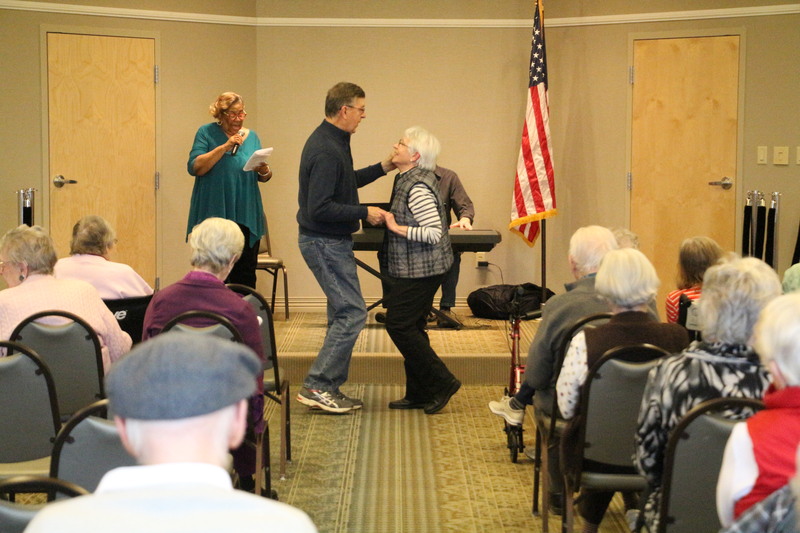 We’ve Got Rhythm is a program that brings a teaching artist, a vocalist, and a pianist into an assisted living facility and spends one hour a week for four consecutive weeks engaging residents in jazz music. 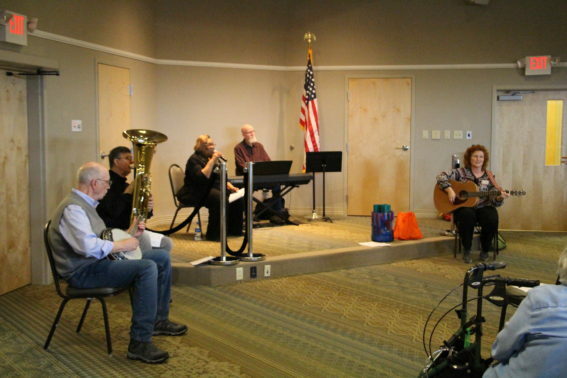 We have been fortunate to attend a total of six assisted living facilities over the past three years and reconnect the residents with the music of their youth. This season, we visited Willow Brook Christian Communities and Sunrise of Bexley. Willow Brook was our Monday session and is located in Delaware, Ohio. This makes it a little bit of a hike for our Columbus jazz musicians, but the smiles of the residents’ faces made the trip beyond worth it. 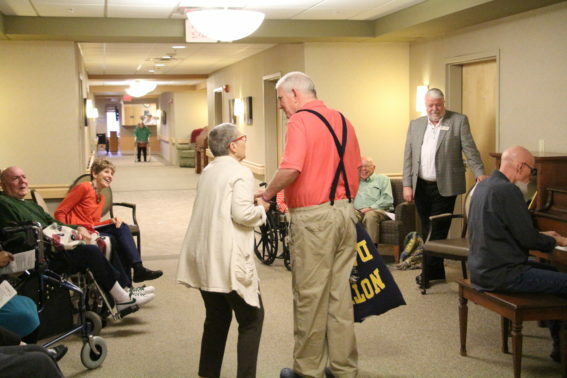 Willow Brook is a very large facility that hosts older adults of every care level. This gave us the opportunity to do two visits at one location, one in the memory care unit and one with the assisted living community. These two groups of people have very different needs, and it was wonderful to be able to better adapt to those needs in each session. and make him laugh. It didn’t seem to be working very well. Mary McClendon then joins Dave in singing I’ve Got Rhythm. 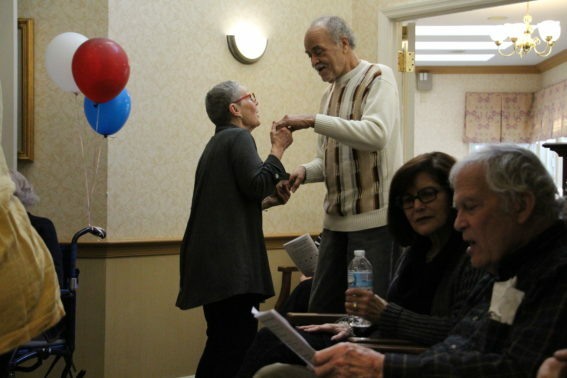 Some residents remember the tune and some are joining in as Becky Ogden begins singing and dancing with the residents. A nurse and some family members have begun doing the same and the residents are smiling ear to ear. Coach comes back down the hallway and Becky jumps in front of him again. This time, a smile breaks across his face and he begins to sing. Becky takes his hand and dances with him down the hallway. The following week a relative of the pacing man came earlier than he usually does because he heard about how happy the program had made Coach. After the program at the memory care unit, we navigate our way to the Summit Room on the third floor. There are already about 35 people sitting, ready to hear us perform. I start to hand out our Jazz Songbooks which has lyrics to over 20 different songs so that the residents can sing along with us. By the time I am done passing out the books I have to get 15 more for the residents who have just walked in. Dave starts playing the keyboard and shortly after Mary joins in. Becky runs around with her microphone inviting residents to sing along and take a solo. 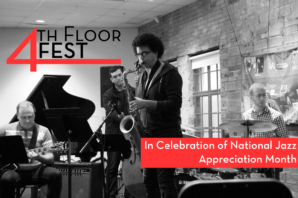 Over the course of the four visits, we had residents perform over 35 solos for their peers. Some individuals were phenomenal vocalists and some could barely carry a tune, but each soloist felt they had gone out of their comfort zone and done something exciting. Becky asked the residents a lot of questions; What high school did you go to? Did you go to prom? Did you have a band or DJ play at your prom? Where did you use to go to dance? Did anyone use to play an instrument or sing in a choir? We learned a lot about the residents at Willow Brook. Some of them have been playing music their whole life and some only ever listened to it. Some were still playing and brought their instruments on the third visit to learn C Jam Blues. I thought it was a little strange to see a tuba and a banjo in a jazz band, but I learned that those instruments were some of the original instruments used in jazz! A lovely couple on the first visit jumped up to start dancing because they were taking lessons and wanted to show off their moves. On the third visit I offered a songbook to a man in a wheelchair who promptly informed me that he had no use for it because he is blind. However, that didn’t stop this man from singing along with almost every tune. The songs he didn’t know? He whistled. The residents at Willow Brook were engaged and excited throughout the entire four week program. The residents even asked if we could come back on a quarterly basis. At the end of our last visit they presented us with a giant homemade card that thanked us for coming and had several pictures of our time together on it. It was a privilege to partner with Willow Brook this winter. While Mondays we visited Willow Brook, Fridays we visited Sunrise of Bexley. This facility is much smaller and the residents started off a little less engaged than what we saw at Willow Brook. However, by the fourth visit we had residents singing to every song and recalling memories from their past. On our first visit a woman had balloons tied to her chair for her birthday. Naturally, we all sang a jazzy version of Happy Birthday for her. We also played God Bless America each Friday because we had several veterans among us, including a World War II veteran who remembered and sang every word. Across both facilities, residents seemed to know the lyrics to I’ve Got Rhythm, It Don’t Mean a Thing If It Ain’t Got That Swing, Blue Moon, Carolina in the Morning, Bye Bye Blackbird, Let it Snow, and Sentimental Journey. While Honeysuckle Rose and Blue Skies were quick to be learned and loved. Overwhelmingly, the residents told us that this program made them happy, feel more creative, and that they would recommend this program to a friend. We are so grateful that we have the opportunity to provide educational programming to lifelong learners. Seeing people get up and dance or sing a song for the first time in a long time makes me love what I do because I can see that it makes them smile and laugh. Improving the quality of life through engaging older adults with music from when they were young is what we aimed to do through We’ve Got Rhythm and I firmly believe that we have done that. Thank you to the Ohio Arts Council for supporting Jazz Arts Group as we explore new opportunities for lifelong learning and jazz education. We are looking forward to the chances we may have in the future to further this kind of programming. If you are interested in supporting programing like this, please reach out to myself, Alexa Brennan, at abrennan@jazzartsgroup.org or (614)-294-5200 ext. 117.